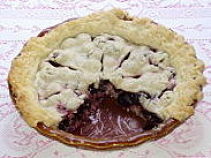 Cherry Pie is traditional for February because of Washington’s Birthday, but this month’s pie was inspired by Miles Davis too. What’s the Miles Davis connection? Milestones, the 1958 album from Miles’s bebop period, includes an instrumental version of the tune—such a tribute to the playfulness and inventiveness of that art form, to start with a children’s song and improvise it into one of the most out-there tunes ever recorded. I found the recipe for this crust in an out-of-the-way cookbook. You’ll notice that the proportion of shortening (vegetable shortening and butter) to flour is much greater than the proportion in conventional pie crust. This makes the crust hard to handle, and I ended up with a pie that is not as photogenic as some of my previous ones. In fact I was going to start over with a new batch of filling and a crust made with the standard two-thirds cup shortening to two cups flour, but my husband and I each had a piece of the pie for dessert. We continued to nibble to the point that I was afraid there would be no pie left to photograph unless I grabbed the camera fast, so I decided to use this crust. It may not be very photogenic, but it is incredibly rich and flaky. Sift the flour and salt together into a medium-sized bowl. Cut the shortening and butter in with two knives, scissor fashion, or use a food processor with the normal blades. If you’re using a food processor, return the mixture to the bowl afterwards. Now add cold water a tablespoon at a time, tossing the mixture with a fork till it starts to cling together. You might need anywhere from three to six tablespoons of water, or more, but don’t add more till you’re sure you need it. You don’t want your dough to become gummy—you just want it to cling together so you can form it into a ball. With floured hands, knead the dough together but don’t handle it too much. Divide it into two portions, one a bit bigger than the other, and pat them into flat rounds. If you have time, chill them for twenty minutes or so before you try to roll them out. All the shortening in this recipe makes the dough very fragile and chilling it helps it hold together. Whether you chill or not, you’ll find that you end up with a crust that’s a bit thicker than with a normal pie crust because it’s very hard to roll this rich dough thin without having it fall apart. Roll out the larger piece of dough and use it to line your pie pan, patting it into place. Trim the edges so you have a half-inch overhang. Add the cherry filling. Mix together gently before spooning into the bottom crust. Roll out the smaller piece of dough and lay it over the top of the pie. Trim the edges to match the bottom crust. Press the top and bottom crusts together and tuck the overhanging crust under all the way around. To make a fancy edge like in the picture, place the index and middle finger of your left hand on the edge pointing out and with half an inch between them. Use the thumb of your right hand to push a little ridge into the dough, working your way all around the edge of the pie doing the same thing. You’ll have better luck getting a nice edge to form if you have chilled your dough before working with it. Bake the pie at 350 degrees for about 45 minutes or until the crust is golden and looks thoroughly done. Vanilla ice cream probably isn’t necessary but it’s a great addition.